On April 25, 1507, the term “America” was first used on a world map, referring to the huge mass of land in the Western Hemisphere. 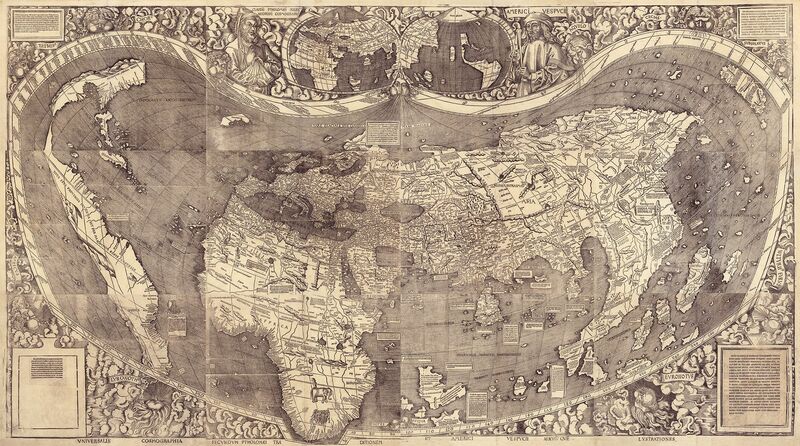 Published in 1507 and composed of 12 individual sheets, Martin Waldseemüller's world map is the first known to bear the name, "America" in describing the New World. On April 25, 1507, the term “America” was first used on a world map, referring to the huge mass of land in the Western Hemisphere. Martin Waldseemüller, a German cartographer, used the name “America” in honor of Italian navigator Amerigo Vespucci. Vespucci, in addition to being a friend of Christopher Columbus, was an avid traveler who described his travels in letters and journals. These letters, along with the works of the Greek geographer Ptolemy, helped Waldseemüller define the landmasses in his book Introduction to Cosmography. (Waldseemüller’s America actually identified what is today South America. “Parias” is the name Waldseemüller identified with what is today North America.) In addition to this book, Waldseemüller published 1,000 copies of a woodcut world map. Both the book and the map were widely regarded, and the term “America” was eventually universally accepted.